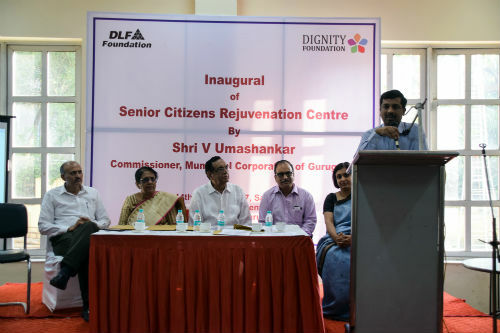 Gurgaon: Gurgaon Municipal Commissioner Mr. V Umashankar inaugurated Senior Citizens Rejuvenation Centre at the DLF Community Centre, DLF Phase 2 Gurgaon. A joint venture of DLF Foundation and Dignity Foundation, the project is a recreational centre catering to senior citizens. The centre, which is open to all senior citizens, will host a plethora of activities like Tai Chi and Yoga, laughter club, spiritual lectures, aerobics, quiz and games, birthday celebrations, panel discussions, hobby and craft classes, festival celebrations, quarterly outings and the like for the recreation and enrichment of elderly people. Activities for the elderly will be organized 5 days a week for 2 hours every evening. DLF Foundation and Dignity Foundation are launching the first pilot Senior Citizen Rejuvenation Centre in Gurugram with the aim of creating an engagement platform for Senior Citizens to interact socially, build a support network, boost their self-esteem and lead an active life. “In today’s fast-paced world, we, senior citizens, have become neglected. 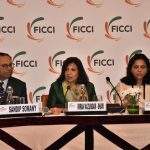 There is a need for opening of more such centres which will help us find a good company and spend our time productively,” said Sunita Das, a senior citizen. In recent years, the elderly population in India has been rising and currently account for about 8.6% of the total population, according to Census 2011, as compared to 5.6% in 1961. This, in turn, has created demand for special services catering to elderly like recreation centres, old age homes and the like. According to the latest Lancet Global Health study supported by WHO, close to 16% of people aged 60 years and above are psychologically abused, financially exploited, neglected, physically hurt or sexually abused. One in five elderly people in India experience some form of abuse.